The mixed-use development lies in the heart of the Embassy District of the capital, within the Central Business District, overlooking the central park of the city and adjacent to two five star hotels. Orientated to the South, the Olympic Residence offers unparalleled views over the Bodg Khan mountain range, as well as a unique cityscape. Construction began in 2010 and was temporarily halted in 2012, with just the skeleton completed, as a result of challenging economic conditions following the economic downturn in Mongolia and the continuing impact of the global financial crisis. Construction recommenced in 2013. The development will have residential GSA of approximately 27,500 sqm and commercial GSA of approximately 5,215 sqm at the base of the building, and will feature 92 luxury apartments, four floors of luxury retail space and two floors of underground parking. The residential space will comprise approximately 76.9% of total GSA, the retail space will comprise approximately 14.6% of total GSA, and the parking will comprise approximately 8.5% of total GSA. 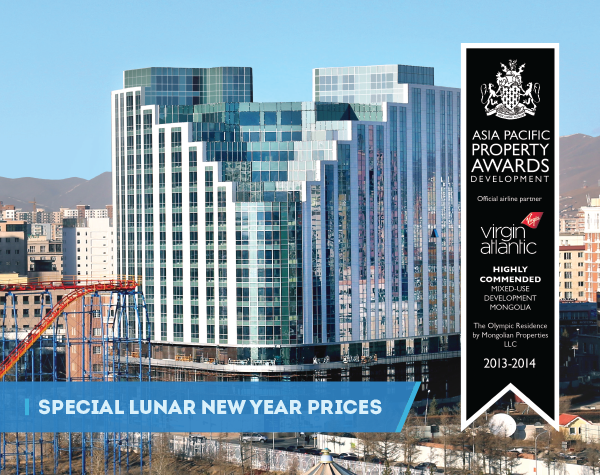 Currently, the exterior of the development has been completed, interior construction is on-going, and the project has received all permissions necessary to complete the development, including permission to connect to the Ulaanbaatar heating grid. 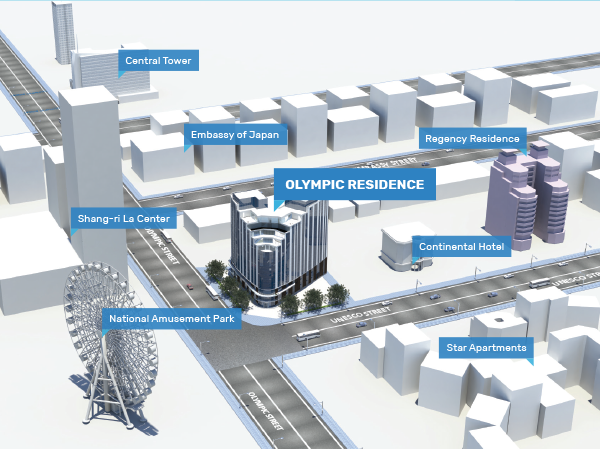 Olympic Residence: The Olympic Residence is a 35,000 sqm, awarding-winning, mixed-use development, and one of the most highly anticipated projects in the Ulaanbaatar CBD. The development features four floors of Grade A commercial space and 99 luxury residential apartments. Due for completion in Q2-Q3, 2017, the Olympic was a collaboration between APIP, London based-interior specialists, Rive Gauche, and international architects, Voodoo Associates. Designed to appeal to an expanding expatriate community and Mongolia's emerging upper-middle class, it occupies a prime location in the city. It is in close proximity to luxury branded stores, international embassies, and the recently opened Shangri-La Hotel. Apartments enjoy expansive views over the surrounding countryside, whilst elegant interiors and accessibility combine to make it an appealing residential address and compelling investment opportunity.